NOW Foods 5-HTP Veg Capsules is the intermediate metabolite between the amino acid L-tryptophan and serotonin. This is extracted from the seed of an African plant (Griffonia simplicifolia). 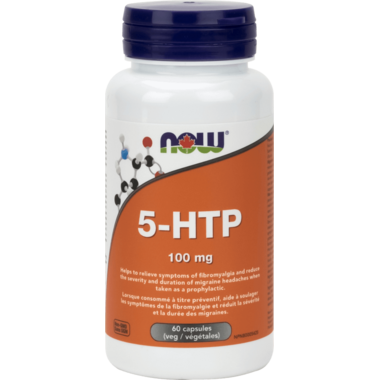 5-HTP readily crosses the blood-brain barrier and increases central nervous system (CNS) synthesis of serotonin. Serotonin can affect sleep, and many other important biological functions. This is a mid-range dosage of 5-HTP. Fibromyalgia: Take 1 capsule 3-4 times daily with food. Use for a minimum of 2 weeks to see beneficial effects. Consult a health care practitioner for use beyond one year. Migraines: Take 1-2 capsules 2-3 times daily with food. Use for a minimum of 2-3 weeks to see beneficial effects. Consult a health care practitioner for use beyond 6 months. To minimize the risk of gastrointestinal side effects, start with 1 capsule, 2-3 times per day and slowly increase to 2 capsules over a 2 week period. Caution: Consult a health care practitioner prior to use if you are pregnant or breastfeeding or if you are taking carbidopa or drugs/supplements with serotonergic activity. These may include, but are not limited to, L-tryptophan, S-adenosylmethionine (SAMe), St. John's wort, antidepressants, pain killers, over the counter cough and cold medication containing dextromethorphan, anti-nausea medication and anti-migraine medication. Consult a health care practitioner if symptoms persist or worsen. Discontinue use and consult a health care practitioner if you show signs of weakness, oral ulcers, or abdominal pain accompanied by severe muscle pain, or if you experience skin changes. Do not use if you have scleroderma. Exercise caution if operating heavy machinery, driving a motor vehicle or involved in activities requiring mental alertness. Some people may experience diarrhea, nausea, vomiting, abdominal pain and drowsiness. Works well for my son and me. 5htp is a great product.